Sharpless2-54 is a bright emission nebula in the constellation of Serpens embedded in extended nebulosity that also contains the nearby Eagle nebula, M16. This HII region is ionized by the young star cluster of NGC 6604 off the bottom of the image. The OB stars of the Serpens OB2 association are young with an age of about 5 million years. Sh2-54 is about 6,200 light years distant and lies about 300 light years above the galactic plane. 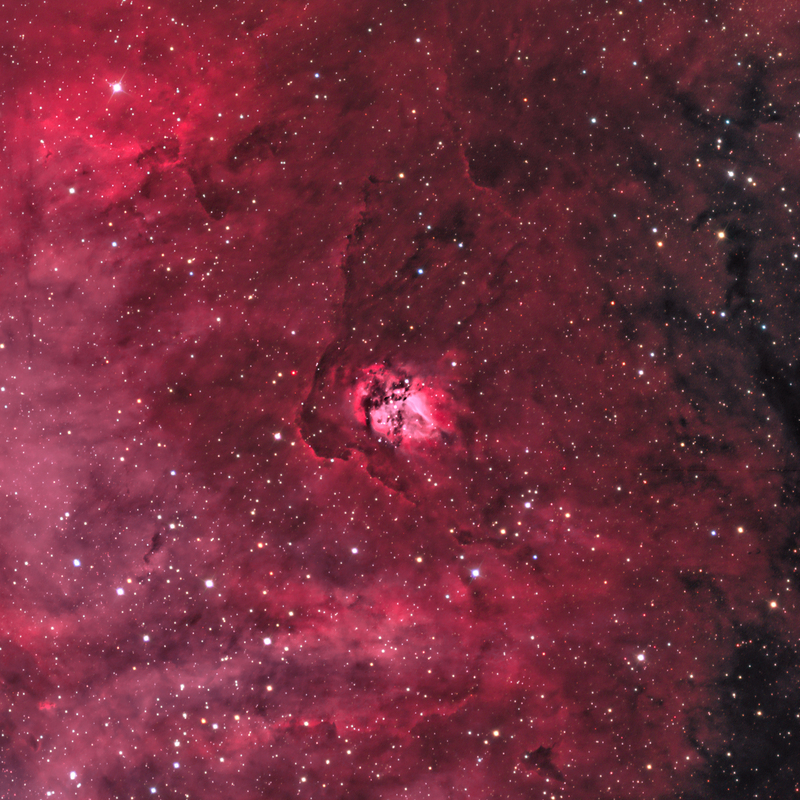 The bright nebula at the center of the image is referred to as Gum 85, the “egg” that sits in the larger “nest” of Sh2-54 (Gum 84). See http://galaxymap.org/cat/view/sharpless/54 for more information. This image combines the extra contrast for the nebula from narrowband filters (10hrs) with shorter data (2hrs) from RGB filters for star colors. Emission data obtained from the 5nm H-a + N[II] filter were color-mapped to red/magenta and those from the 3 nm OIII filter were color mapped to blue-green (teal). North is up and East is to the left. The image size is 36′ x 36′. The master is back, love it! Some emission nebulae can have nice structures.